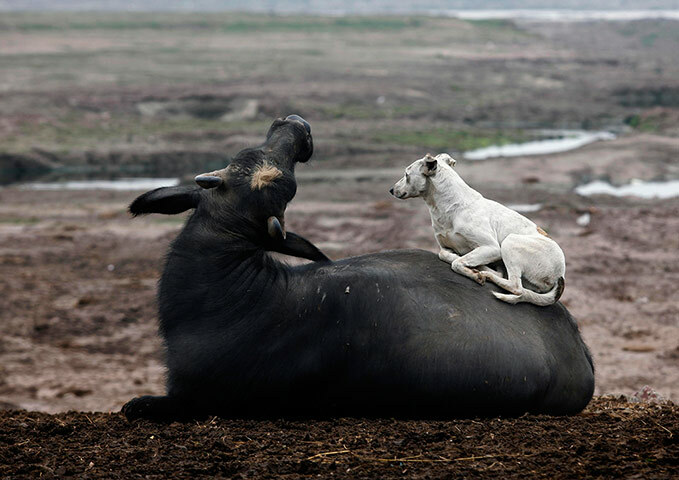 incredible sadness | Animal on Animal. They hadn’t seen each other since before the war. The last time they had met, petty worries about locking your door or whether the oven was on still existed, children still asked for toys at Christmas. Times had changed. George had changed. He could just about remember a time when his back leg didn’t ache, when his thoughts were not so soupy. Just about. The old dog screwed up his failing eyes to try to make out what the big brown shape lumbering towards him from across the road was. It certainly wasn’t the bus he was waiting for. Buses didn’t cross roads like that. The brown smudge got much larger until it filled George’s vision, he took a little step back. “George?” a familiar voice boomed above him, far too loud and close, as always. Through the cloudy mess of his thoughts a bolt of recognition cut a path through George’s mind. “Hah, as if I would let a little war kill me off!” Bill smiled. “Have I got some stories for you…” George sighed. So they talked until the sun went down. Bit of a departure from the norm there, not sure what came over me. Thanks to Dannie for the image, which is obviously from the Guardian. Obviously. Dannie.